I have a friend, Al, who served in the U.S. military for several years. This was decades ago, but he can often be seen wearing a VFW jacket or a ball cap commemorating one of the wars in which he served. I met Al in a homeless shelter. He’d struggled with homelessness on and off for five years, and he could never quite seem to make it through the Veterans Administration bureaucracy to get the benefits he needed to stay housed. Until recently. Through the perseverance of the shelter’s dedicated staff and volunteers, and through new outreach by the VA, Al and his son now live in a townhome, sheltered from the elements. He no longer has to curl up on the church steps where he’d slept for so many nights. Nearly 1 in 4 people experiencing homelessness in the United States is a veteran. And these are not all Vietnam or Korean War vets; veterans returning from the conflicts in Iraq and Afghanistan, including female veterans, are finding themselves on the streets. Veterans are a big focus in the U.S. Interagency Council on Homelessness’s new federal plan to end homelessness. Secretary of Veterans Affairs Eric Shinseki has made a commitment to end veteran homelessness in the next 5 years. On Tuesday, the Interagency Council held a webcast on veteran homelessness. You can view it here to learn more about what the federal government plans to do about this tragedy. I have a photo on my desk of Al to remind me why it’s so important to persevere in our efforts to end homelessness. 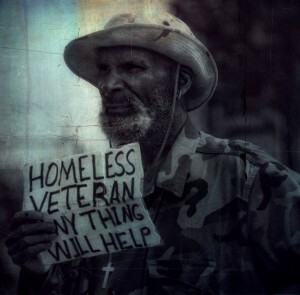 As we observe Veterans Day this year, we at the National Law Center on Homelessness & Poverty are deeply aware of the injustice of homelessness among those who have served our country in the military. We remain committed, as always, to work toward a United States where homelessness is a thing of the past – for everyone. This entry was posted in Veterans and tagged federal plan, homelessness, USICH, veterans. Bookmark the permalink. My Nephew Jason J. Bellanger served in Desert Storm, was on secret missions in Japan. He carried the big gun on his back. Jason is 5’2″ a small guy. When he returned home, he had back surgery to repair popping disks, he has never been the same, he still limps and complains of back problems. He never talks about what he seen over seas, but he did mention in his letters of snipers that took some of his fellow soldiers out, he has a drinking problem now. He has never asked for help from the government because of the red tape you have to go through so he does not get any disability or nothing. We have tried to talk him into going in and see if he can be compensated with something. I feel sorry that they fought for their country and now they have to fight to make ends meet now. As in the past, today many veterans suffer from known or unknown mental health issues. These issues come from the cognitive behavior training on how to survive in combat. Dealing with behavioral change can help some of the issues that they face today, Understanding how other can survive and why they have trouble can make all the difference. In my opinion, hats off to the men and women who served in the different military arm forces. The government should be kneeling down; kissing your feet. My prayers go with all of you that some type of relief comes soon! Hold your heads high, and stand proud! You have certainly deserved it!